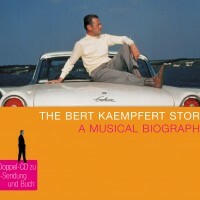 This compilation CD featuring 42 tracks was released in conjunction with the Bert Kaempfert printed biography and the TV documentary on his life story. After three year’s preparation and negotiations with the owners of the copyrights of the many different recordings, we have finally managed to put together this sensational double compilation CD by way of homage to the all-time great composer and band leader Bert Kaempfert. The CD includes a selection of the most beautiful instrumental tracks ever produced by Kaempfert plus vocal versions of his greatest hits sung by famous international vocalists. The CD comes packed in a classic CD box including an extensive CD booklet. All in all, a must for any music fan and collector – and it even makes the perfect gift. The compilation is also available to vinyl fans as a double LP (#583 784-1).